A sweeping system that combines the benefits of the mechanical collection with those of the vacuum system. The Dulevo 5000 City is a simple patented system that is able to collect and load over half a tonne of debris per minute, which allows the collection of a wide range of debris, from the finest dust to more voluminous objects such as bottles, large gravel and even fruit or vegetable market boxes. 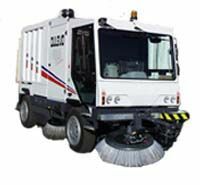 This system enables the 5000 City to work at up to three times the speed of traditional non-combined sweepers. Manual loading is a thing of the past, as are problems caused by blockages that are typically associated with other systems. Simplified maintenance is important for reducing costs - a target achieved with the 5000 City. All the main components are grouped together in the engine compartment which is easily accessible by tilting the cab.